The FCA firm number for Frontrunner Insurance Services Limited is 465390. This means that Frontrunner Insurance Services Limited is authorised by the Financial Conduct Authority and is able to transact general insurance business. Frontrunner Insurance Services Limited is required to issue a combined Status Disclosure and Terms of Business (TOBA) document for both Commercial Customers and Retail Customers (Consumers). A Retail Customer is an individual who is acting for purposes which are outside his normal trade, business or profession, e.g arranging mainly personal insurances. A Commercial Customer is one who is not a Retail Customer. e.g one who is effecting insurance to protect a business. These classifications impact on how certain aspects of FCA regulation affect your position as our customer. Please read our Retail Terms of Business or Commercial Terms of Business for our Terms of Business when transacting your business with us. 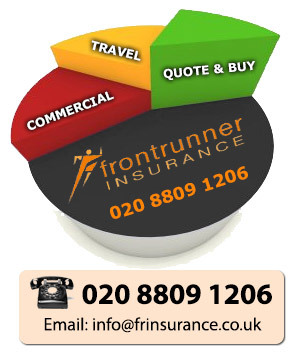 Frontrunner Insurance Services Ltd does not give advice or a recommendation on your insurance needs and wants. We are not responsible for the appropriateness of the product that you might choose or the level of cover chosen. Please see the Terms of Business link on either site that you enter. Should you purchase any of the insurance covers through any of our providers you will have transacted your business directly with them and they should be contacted on their usual numbers provided for any queries, amendments or claims etc. Our providers will also be responsible for issuing renewal notices when applicable. Frontrunner Insurance Services Ltd can not be held responsible for the accuracy of any of the site contents\information contained within the linked sites accessible from our website. However we are always available to help. Please call or contact us if you have any questions. Phone 020 8809 1206 (local rate).